On May 8th JoVE will publish research that demonstrates how a biosensor can detect antibiotic resistance in bacteria. This new technology is a preliminary step in identifying and fighting superbugs, a major public health concern that has led to more deaths than AIDS in the United States in recent years. 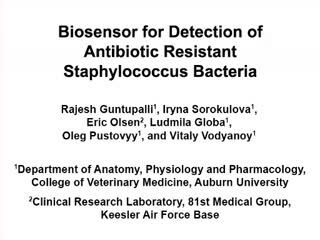 The technology is the result of collaboration between Dr. Vitaly Vodyanoy at Auburn University and the Keesler Air Force Base with funding from the United States Air Force. Louis Pasteur and Robert Koch first characterized antibiosis, the ability for a chemical to kill bacterial cells, in 1877. Since then, the medical and biochemical communities have made great advances in the treatment of bacterial infections. These advances have helped reduce childhood mortality and have contributed to the population growth of the 20th Century. However, natural selection has allowed antibiotic resistant bacteria to flourish and propagate, and continued exposure has lead to the evolution of "superbugs" that are resistant to multiple types of antibiotics. "Antibiotic resistant bacteria is a serious problem," Dr. Vodyanoy says. "It is very important [when treating a patient] to distinguish between normal and resistant bacteria; if you have a case of resistance you have to take special measures to cure it." Dr. Vodyanoy's technology takes advantage of bacteriophages, simple viruses that can target and kill bacteria. A bacteriophage, when combined with specific antibodies, can be used to produce a physical color change in a sample that indicates antibiotic resistance. This technology will be invaluable to clinicians trying to treat patients and disinfect hospital facilities. Specifically, this technique targets antibiotic resistant Staphylococcus, one of the first pathogens characterized as a superbug. Staphylococcus, commonly referred to as staph, often is a bothersome skin condition cured with common antibiotics. However, variations of the staph bacteria can turn deadly when infecting immune-compromised patients or internal organs like lungs and the respiratory tract. The disease is of particular concern to hospitals, prisons, and branches of the military, where individuals are at risk for infection from unhygienic close quarters. "In our method, we can determine bacterial antibiotic resistance in 10-12 minutes, while other methods take hours," Dr. Vodyanoy explains. Alternative methods used to detect antibiotic resistance need time-intensive purification steps before multi-hour sequencing protocols. "We envision a future where clinicians do tests with real blood or saliva samples. The virus is completely benign to humans, and we hope to use it to make antimicrobial surfaces and glassware that kill the bacteria." "Our technique is complex and involves many steps and disciplines. It is very difficult to visualize when you read a paper, and we felt it would be very beneficial and educational to publish [in JoVE]," Dr. Vodyanoy says of publishing in the world's first video journal. "We are interested in someone else reproducing our results; this technology can be used on a larger scale and for antibiotic resistance other than Staphylococcus."